Keeps Shepard and Company's helmets equipped during Priority Mars. No more vanishing helmets! Requires Expanded Galaxy Mod 1.10 or above. 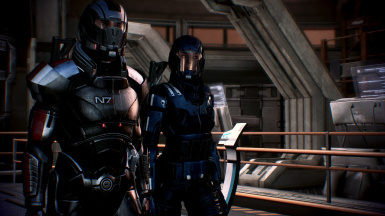 One of the things that always annoyed me, about Priority: Mars, is that Shepard and their squadmates unequip their helmets during conversations with their helmets disappearing into thin air. They then pull out their helmets seemingly out of nothing when it is time to equip their helmets again. The Helmets Stay On is my attempt to fix this issue. 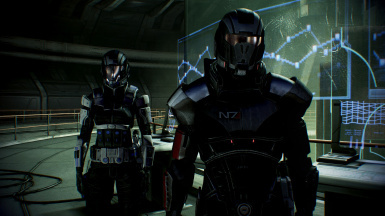 Shepard, James, Liara, and the Virmire Survivor will now have their helmets equipped for the whole mission. This mod does Require Expanded Galaxy Mod (EGM) 1.10 or above. 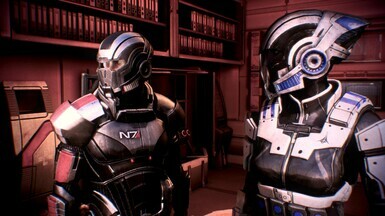 The reason is that for the mod to work properly, you must choose Shepard's N7 Breather helmet, in the armor selection menu that EGM provides, before Priority: Mars. If you don't have EGM, there will be bugs. You must also have the Squadmate Helmet option turned to default on for the duration of Priority: Mars. You can turn this option on by going into Narative in the game's options menu. There will be bugs if you do not do this. As with all DLC mods, this mod also requires WarrantyVoider's DLC Patch files to be installed in Mass Effect 3\Binaries\Win32. This mod requires Expanded Galaxy Mod 1.10 or above. Installation is simple due to the mod being a DLC mod. Just put DLC_Mod_Helmet in Mass Effect 3\BIOGame\DLC. I have included moddesc.ini for Mod Manager users. This mod is not compatible with Backoff by Giftfish. Do not copy files between mods or attempt to delete files. Those of you who are familiar with my mods know that I sometimes provide a list of deletable files to matain compatbility and customization. This will not work in the case of this mod. Attempting to delete files or copy files in the two mods will break both of them. Using both at the same time will break Backoff. I will not support you if you do anything stated here. A patch will not be made. The Helmets Stay On is compatible with every other mod out there. As with all DLC mods, install this mod before ALOT and other texture mods. and easy. This would not have been possible without that program. He also is the author of the ME3explorer fork, which was also essential. The Helmets Stay on is for English versions of Mass Effect 3 only. This is because it modifies LOC_Int pcc files. Attempting to use it with other versions of the game will cause bugs and I will not support your questions if you do so. 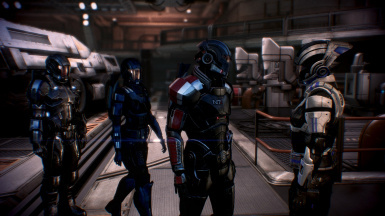 Tranlations will only be allowed to be made if you can prove to me that you can use ME3explorer to mod the game. When I say that, I mean that you need to know how to create mods, not just use the toolset to install mods.